The American Society of Heating, Refrigerating and Air-Conditioning Engineers (ASHRAE) established a standard nomenclature for ground source heat pumps (GSHP). According to this nomenclature that is described in Kavanaugh and Rafferty (1997), GSHPs can be divided in groundwater heat pumps (GWHPs), surface water heat pumps (SWHPs) and ground-coupled heat pumps (GCHPs). GCHP systems can have open loops using the ground with air as a heat carrier or a water reservoir as a direct energy source. In closed loop indirect systems, a ground heat exchanger (GHX) is linked to a water/brine source heat pump. Direct expansion (DX) closed loop systems are those in which the refrigerant of the heat pump circulates directly through the ground coil. 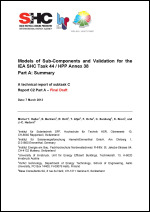 For the purpose of the IEA SHC Task44 / HPP Annex 38, only the GCHP indirect systems will be addressed in this report. 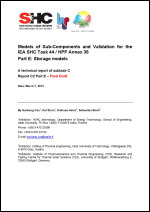 In Subtask C of the joint IEA Solar Heating and Cooling Programme Task 44 and Heat Pump Programme Annex 38 (T44A38), different concepts for solar and heat pump heating systems are evaluated based on annual system simulations. For these system simulations, common boundary conditions have to be defined in order to ensure that different performance obtained by the simulation of different system concepts are not a result of different boundary conditions used for the simulation. 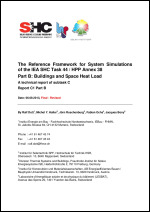 This report describes the definition of the reference space heat loads based on the definition of reference buildings and heat distribution systems. General boundary conditions such as climatic properties, domestic hot water load and properties of ground and boreholes for the simulation of ground heat exchangers are presented in Part A of this report (Haller et al. 2012). Starting from the geometry of the single family house buildings that were defined in the IEA SHC Task 32, three reference buildings with different energetic performance have been defined for T44A38. These buildings are named SFH15, SFH45 and SFH100 according to their space heating energy demand which is approximately 15, 45 and 100 kWh/m2a (140 m2 floor area) in the climate of Strasbourg. Building geometry and construction data define the transmission of heat and solar radiation through the building envelope. Ventilation and shading characteristics as well as internal loads from occupants and electrical equipment are defined. A simplified approach is used for the calculation of the thermal ground coupling of the building. The reference buildings have been implemented in the simulation platform TRNSYS and results from annual simulations are shown both as tabular values and as curves. For all implementations of this reference framework on other platforms it is important to check if the simulation results match the results shown in this report, which are also available in Excel-spreadsheets on the internal Task website. The performance of both heat pumps and solar thermal systems depends significantly on the temperature levels of the heat demand. Therefore, for the comparison of the performance of a solar and heat pump system it is of utmost importance that the simulated flow and return temperatures of the heating system are comparable in the first place. This can be achieved by comparing curves of cumulated energy delivered vs. the temperature that marks the maximum of the flow or return temperature at the time of heat delivery. For the reference framework buildings presented in this report these curves are shown for the different climates of Strasbourg, Athens and Helsinki. Europe launched an ambitious program: 20-20-20 up to 2020, i.e. 20% less greenhouse gases, 20% higher energy efficiency and a share of 20% renewable energies until the year 2020. Ultra-low energy, near or net zero energy buildings are part of the solution. Many of them are equipped with heat pumps. Hence, in future highly energy-efficient buildings, heat pumps will play a key role. Annual efficiency calculation and optimization by means of simulating heat pump heating and cooling systems are very valuable, especially if building and building technology are coupled. 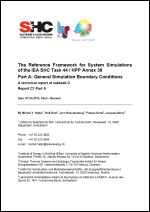 In Subtask C of the joint IEA Solar Heating and Cooling Programme Task 44 and Heat Pump Programme Annex 38 (T44A38), different concepts for solar and heat pump heating systems are evaluated based on annual system simulations. For these system simulations, common boundary conditions have to be defined in order to ensure that different performance obtained by the simulation of different system concepts are not a result of different boundary conditions used for the simulation. These common boundary conditions are described in the reference framework for system simulations presented in Part A of this report. Part B of this report describes the definition of the reference space heat loads based on the definition of reference buildings and heat distribution systems (Dott et al. 2012). The base climates used for the simulation framework are Strasbourg (moderate), Helsinki (cold) and Athens (warm). In addition to these, Davos is used for an extreme mountainous climate and Montreal for an extreme continental climate. The permission has been obtained from Meteotest (Switzerland) to use these Meteonorm climate data-sets for work within T44A38. A mitigation factor of 0.5 has been defined for the estimated wind speed on the collector surface in comparison to the meteorological wind speed. For the simulation of ground heat exchangers, reference ground properties are defined together with standard heat exchanger design (e.g. number and lengths of probes) for the climates of Strasbourg and Helsinki. The domestic hot water load is based on the EU mandate M/324 tapping cycle M. In order to be suitable for the use in annual simulations, adaptations have been made in order to introduce one bath tub tapping per week, the dependency of hot water demand on the cold water temperature of each location and annual fluctuations. In order to compare results of these boundary conditions implemented on different simulation platforms, monthly parameters and heat load distribution curves have been defined. A spreadsheet is provided for download on the internal task website where the results of the reference simulations performed with TRNSYS 16.1 can be compared with the results of the implementation of these boundary conditions on any simulation platform. 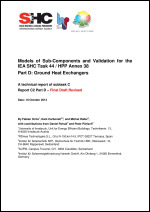 This report has been established in an international cooperation in the framework of the IEA SHC Task 44 / HPP Annex 38 on solar and heat pump systems (T44A38). Subtask C of T44A38 deals with modeling and simulation of solar and heat pump systems and their components. 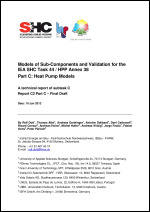 Report C2 of subtask C gives an overview of recent developments and the state of the art in component modeling in this field. This report has been split into several parts: Part A: Summary Part B: Collectors Part C: Heat Pumps Part D: Storage The summary presented in this Part A of Report C2 has been published in a paper at the Solar Heating and Cooling Conference SHC 2012 in San Francisco (Haller et al. 2012). The version presented in this report contains additional figures compared to the final printed version in the proceedings of the conference, as well as minor changes in the text, and an additional chapter on storage. It does not contain the editorial changes of the conference proceedings. The original paper reference is: Haller, M.Y., Bertram, E., Dott, R., Afjei, T., Ochs, F. & Hadorn, J.-C., 2012. Review of Component Models for the Simulation of Combined Solar and Heat Pump Heating Systems. Energy Procedia, 30, p.611–622. DOI: 10.1016 / j.egypro.2012.11.071. In this report, the models for the thermal energy storage systems have been reviewed and listed. The categories of the thermal energy storage models listed in this report are depicted in Figure 1. As shown in Figure 1, the thermal energy storage can be categorized into the latent energy storage (mainly phase change material storage - PCM) and sensible energy storage. For the latent energy storage, there are six representative forms in the practical application: microencapsulated PCM-slurries, capsulated PCM storage modules, multi-layer PCM unit, snow storage, ice storage, and hybrid PCM-sensible storage unit. For the sensible energy storage, there are two representative forms in the practical application: sensible liquids and sensible solids. Furthermore, based on the time scale of the storage, the categories can be divided into short term and seasonal storage. In this report, if the storage module is for seasonal storage, it will be specifically mentioned in the classification. The theoretical principles of different categories of storages are different, and are not the main theme of this report. Representative numerical models have been reviewed and listed according to the categories. In Section 2.1, the latent energy storage models are reviewed and listed, while in Section 2.2, the sensible energy storage models are presented. The validation of these representative models are introduced in Section 3. The summary table for storage models with respect to certain section is listed in Appendix A. Solar thermal and heat pump systems are one of the key elements for our future high efficient energy supply. In this context, realistic and reliable description of solar thermal collectors in solar heat pump systems is of great importance. This report gives an overview of solar thermal collector models. For system simulations most of the existing numerical models for glazed solar collectors are applicable. However, for unglazed collectors the typical operating range is extended to low temperatures. As a result, little experience exists under these operating conditions where significant changes of the collector performance may be expected for instance due to condensation of water vapour on the collector surface. In recent works in and outside T44/A38, the effect of condensation has been included to establish collector models for unglazed collectors. Validation and application of unglazed collector models has been conducted and is described. The investigated models show good agreement with measurements. In addition, work on condensation, in particular, real applications and the transfer of the results to systems simulations along with validation is still needed. 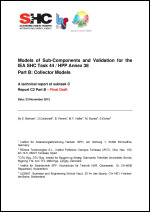 Additional collector models have to be applied for the simulation of photovoltaic thermal (PVT-) collectors. The vast majority of commercially available PVT collectors in combination with a heat pump are modified PV modules and therefore unglazed. Although more experience is needed in this area, first validation measurements reveal, that a simple extension of thermal models by an electrical model suffices for good accuracy in thermal and electrical modelling. To conclude, no principal difficulties are to be expected and a first model with some validation data is already presented. Overall, adequate models are available allowing the description of liquid cooled glazed and unglazed collectors. Nevertheless, further validation work should be conducted to confirm the reliability of the models in the extended low temperature applications. This should not be restricted to condensation but also to night-time operation without solar radiation or any other effect in the low temperature operating range. Both, collector model validation from experiments and system model validation and long-term experience from field measurements should be included.